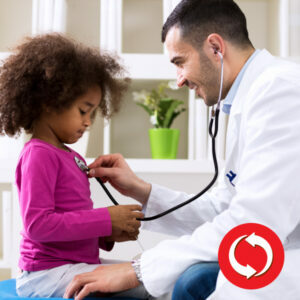 Co-branded with the American Academy of Pediatrics (AAP). 1 and 2 rescuer child CPR and AED use. 1 and 2 rescuer infant CPR. Cardiac, respiratory, and shock case discussions and simulations. Key changes in pediatric advanced life support reflecting the new science from the 2015 American Heart Association Guidelines for Cardiopulmonary Resuscitation and Emergency Cardiovascular Care. Rhythm disturbances and electrical therapy. Systematic Approach to Pediatric Assessment and Vascular Access. Classroom-based work for learners who prefer group interaction and instructor feedback while learning skills. Course uses learning stations for practice of essential skills and simulated clinical scenarios that encourage active participation. Pediatric Advanced Life Support (PALS) is a classroom, video-based, instructor led course that uses a series of simulated pediatric emergencies to reinforce the important concepts of a systematic approach to pediatric assessment, basic life support, PALS treatment algorithms, effective resuscitation and team dynamics. The goal of the PALS course is to improve the quality of care provided to seriously ill or injured children, resulting in improved outcomes.